The one thing the crew might not like about being blogging assistants is some of the products they must review. Oh, I’m not talking about food, treats or toys, obviously, but they are not thrilled when a box arrives with gasp…shampoo! Our Isle of Dogs pack luckily consisted of not just shampoo, but a simpler brush spray and some treats. Disclaimer: This post is sponsored by Isle of Dogs; we were compensated in exchange for our fair and honest review. 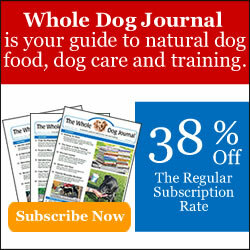 Wag ‘n Woof Pets only shares products we believe will be of interest to our readers. All opinions are our own. *This post also contains affiliate links; if you order through these links we will receive a small commission. I’ve mentioned before that we’re doing as much as we can to keep Sheba’s life stress free, so her immune system can focus on just fighting the cancer. That means no more trips to the groomer, and not even baths at home. However, I can’t help it; I like my dogs to be pretty and clean. When Sheba was swimming in the summer, she’d get a good rinse off in the lake and that helped to keep her cleaner. Simply brushing would be enough to keep her looking good. It’s difficult to fight the mats she sometimes gets, but I do the best I can to keep up with them, though sometimes the scissors have to come out to clip one off. The Isle of Dogs Coco Clean brush spray was exactly what we needed to make a good brushing go even further, and get her fresh and fluffy so a little patch of missing fur wouldn’t be so noticeable! The calming lavender and lemon balm scent took it up even another notch. What better to help keep her relaxed when I have to pull on one of those mats a bit to get it out than having a little “aromatherapy”? When she was done, we were all happy. She smelled and looked better, and I know she feels better when we get that dead fur out. The spray helped to smooth her coat and you can see here how nice she looked afterwards! She likes to strike a pose when she knows she looks good! We also received some Chillout* treats which I’ve been using for times things might be a bit more stressful for all the dogs. They all had some when contractors were coming over to work around the house, and Luke had some before his vet visit. These soft & chewy dog treats are sourced and Made in the USA and free of unnecessary ingredients like wheat, corn, soy, and artificial flavorings. I can’t honestly say if the calming effect of these treats was very effective or not. Luke didn’t do as well as I hoped at his vet visit, but overall he did a bit better than expected. I thought why not give him a couple before his bath too? Since they are made from whole food based and nutrient rich ingredients, what could it hurt? Plus they love them, and Luke deserved some treats before heading in to his bath! Yup, Luke was the lucky crew member that got to try out the shampoo! I didn’t want Cricket slipping and sliding around the shower with her bad knees. Of all the things Luke is fearful of, he’s pretty good about baths, and much better than Cricket. The pleasant smell of the shampoo probably helped keep both of us calm! It lathered up nicely and rinsed out well, so it didn’t take any longer than it needed to. He started to get antsy towards the end, but that was the worst of it. I must be honest, lavender is not my favorite scent, but the hint of lemon in there helped, and he really did smell good afterwards, just like Sheba had. His white fur was white again, and he was so shiny and soft! Whites are white, blacks are shiny! These CocoClean products are soap-free and infused with coconut oil. We love coconut oil and its benefits around here! It promotes a soft and healthy coat and relieves dry, itchy and flaky skin. Luke tends to get that in the winter, but the coconut oil will help strengthen the skin barrier and it’s an all-natural deodorizer. This will be a great shampoo especially for the winter months around here. Doing this to him is my favorite reason to give him a bath. He’s so darn cute! There are also conditioners and other scents and types of shampoos and brush sprays in the CocoClean line – including tearless, sensitive skin, and de-shedding. In addition to the Chillout, there are Soft & Chewy treats for joint* & skin* care or training*. Visit Isle of Dogs on their website to find out more about their other treats and grooming products as well! You can also find them on Twitter and Instagram. Luke doesn’t look any worse for wear after his bath, does he? Just drying off in front of the fire and hanging with the Dadz! Our dogs missed out on fall swimming so they could use a bath….lol. Those sound like great products. I actually wouldn’t have thought swimming would really make such a difference….but Sheba loves to rub in the dirt. When I took her to the lake, it would all just wash right off! I just didn’t really expect that, especially with her long fur that collects everything! Sheba looks beautiful!! We don’t have a place where I could have given Callie & Shadow their baths here at home, so I’m very thankful we have Auntie Andrea to do their grooming. She loves my girls – and they have always loved her – so it works out well. I have found that Lambert-Kay’s detangling spray works well on Golden mats, though Shadow doesn’t get mats as easily as Callie used to. Shadow gets those little pin knots at times, but I can usually work those out fairly quickly and easily. Sheba really loves the girl at our vet’s office that did her grooming, but you know, it’s the vet’s office! Plus she would work on her in between doing other things, so Sheba was usually there for a good part of the day. I’m glad you have someone for Shadow that she likes! I did have a detangling spray at some point – I’ll have to see if I can find it, it might help even more. Love the idea of a coconut based shampoo. With Sam’s work at the hospital, he has to be bathed every time so I try to look for shampoos that are easy on the skin and easy to rinse out. He thinks Elsa could be the shampoo tester and he’ll stick with just reviewing treats. ???? It’s great that you got something to help keep Sheeba’s tangles tamed and get her coat fluffed up. She looks beautiful. Luke looks fantastic after his bath and drying in front of the wood stove looked pretty cozy. We’re glad we’re cats and don’t have to worry about getting baths. Though we do get brushed to stop us from shedding and mats…’specially Zoey. We haven’t tried this brand, but it always has a nice sound to it. You all look great! I am so glad that you like Isle of Dogs. We just won some and haven’t had a chance to try it. Great review! I sure am glad we don’t review bath products! That looks like great stuff. I love coconut oils products, Roxy tends to get a little dry, and Torrey needs a soft coat too. Ooh, peppermint shampoo, now that sounds nice. Perfect for the holidays! Cricket and Rye do seem a lot alike! I’ll be using the brush spray on Cricket as well. Even sitting still for brushing is a challenge for her, but much easier than wrestling her for a bath. I agree about the calming treats – you probably have to use them consistently for some time before they would really work. You guys look great!!! What a great bath time! Sheba does look clean and fluffy after that brushing.